It may be snowy outside, but in my kitchen it smells like spring. The seed starting mix has a wonderful aroma–rain, robins and earth all rolled into one! I could not have been happier than to open that bag and get a really big whiff of it. Finding containers to plant things in was another matter altogether. I mistakenly thought that I had some old black plastic trays in the garage. I also looked in vain for last year’s little plastic pots from nursery seedlings. I know that Lee Valley Tools has a fancy gizmo to make your own little containers out of newspaper but I didn’t want to put off sowing my seeds yet another day. My leeks were two weeks behind already. Patrick Lima, in his book “The Organic Kitchen Garden”, suggests that anything at all can be used to start seedlings–old yogurt containers, egg cartons, the bottom half of carboard milk jugs. While I was contemplating just how many eggs I could eat before bedtime, I realized there was one last place to check for pots. Sadly, it involved a flashlight. The neighbours already know I’m crazy (they have seen me gardening in my nightgown) but I’m sure they wondered what I was doing out in the backyard in the dark on a cold, snowy night. Nevertheless, I went to the wooden shelves just inside the back gate and poked around. It took some courage to stick my hand into dark places I couldn’t see but imagined to be full of spiders (I know that’s silly, of course, given that it’s still winter!). Success! I found just a few leftover pots that were small enough to put on a tray. They are the perfect size to put in the windowsill, too. So I brought them in, washed out the snow, and filled them up with that beautiful smelling dirt. What fun! I opened the packets for Leeks and planted those first. 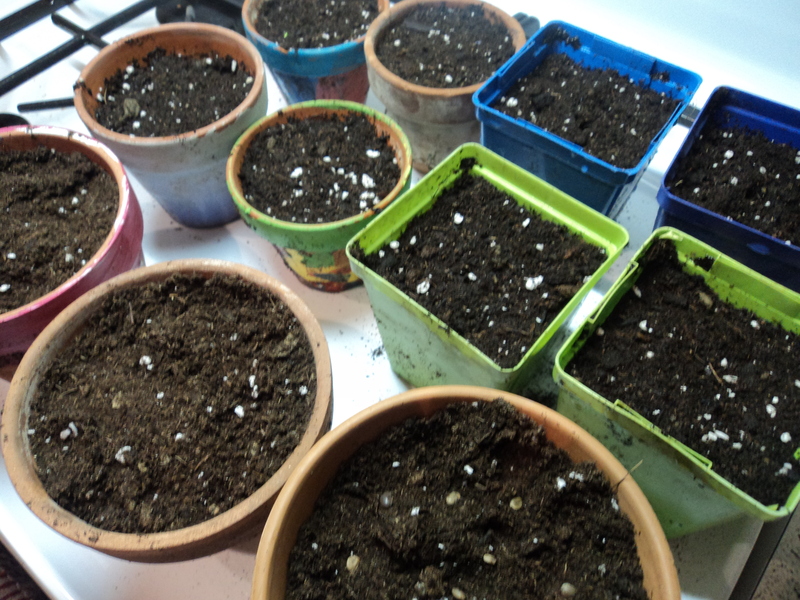 Next, I planted some old Lupins seeds–I have no idea where I got them from, but thought it was worth a try. Finally, I opened a small brown envelope with “Maltese Cross” handwritten on the front. Those are from Larkwhistle, the garden of John Scanlan and Patrick Lima in Dyers Bay, Ontario. I have never grown them but they are reported to be a hardy perennial with beautiful, tall, red flowers. I made sure to water each pot carefully with tepid water. I had to use my hands, since I don’t have a watering can with a fine enough spout. (Note to self–one of those might be helpful for the next batch of seeds). And, at the very last moment, I remembered the wise advice I received from another gardener–label your pots! Luckily, my daughter Emily had some leftover craft sticks from her last project (she always seems to have some kind of craft project on the go). With those and a black marker, my seeding session was complete. Now to wait on God to bring life. This entry was posted in Uncategorized and tagged life, plants, seeds, vegetable. Bookmark the permalink. Just for the record… spiders live through the winter so your fears were, in my opinion, well founded. I’m looking forward to following your growth. Really?? I am so glad I didn’t find out the hard way! Device for making seedling pots out of newspaper? (Head comes up like bird dog on point.) That’s going on the list of projects as soon as I get a shop I can take three consecutive steps in …. Oh, yes, they’re good. Quite good, really. The model I have specs for was made by a guy who’s married to a deranged avid gardener, and modified according to her specs…. Funny. I just went looking for a ‘like’ button. Beautifully said! I am so happy for you as you dream and plan and plant.